Rabbit is a tricky thing to cook. Braising is the usual method — something that always always puzzles me as rabbit is very lean, and there really isn’t any tough connective tissue to break down by slow, low cooking. Shorts ribs, it is definitely not. I also have this sad tendency to slightly overcook my rabbit, leaving the meat a little on the tough side. It’s as if the bunny was tensing up in order to leap out of the pot to give me the finger. 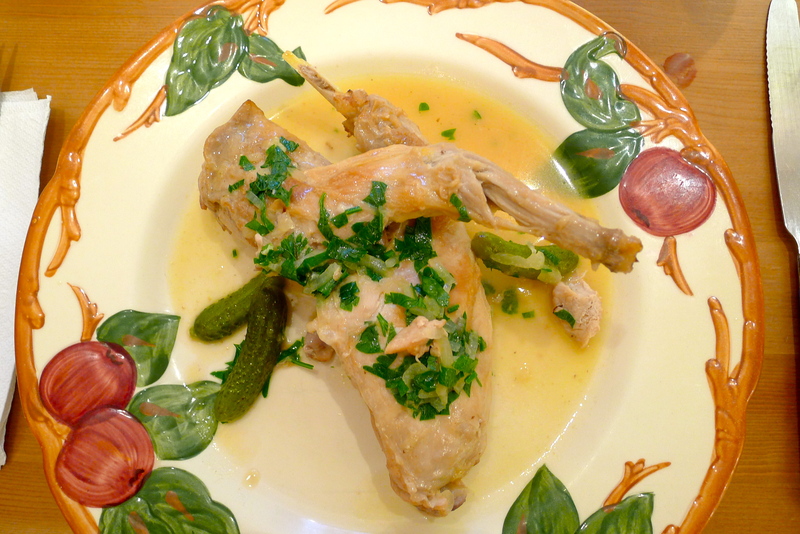 But when I tried Gabrielle Hamilton’s recipe for braised rabbit published in the New York Time a few weeks ago, the dish turned out like a dream. I didn’t actually have the 8 hind legs called for in the recipe, just one rabbit that I had butchered myself into 6 pieces. If you have never broken down a whole rabbit before, here is a good step-by-step tutorial from Saveur. If I were to do it again, I might butcher two rabbits — leaving me with a nice mess of fore and hind legs — and save the loins and saddles for another dish calling for rolling and stuffing. 2. Season the rabbit pieces liberally with salt and pepper. In a large, heavy Dutch oven, heat the two tablespoons of vegetable oil over medium-high heat until it starts to shimmer. Sear the rabbit pieces on both sides. Transfer the browned pieces to a plate. 3. Lower the heat to medium. In the same pan, sauté the shallots until they are tender but not browned. Add the cornichons, brine, and vinegar. Bring everything up to a simmer. Return the rabbit pieces and any accumulated juices to the pan, spreading the rabbit out as evenly as you can over the bottom. Add just enough chicken stock so that the rabbit pieces are covered by about 1/2 inch of liquid. Bring the liquid to a boil and then turn off the heat. 4. Cover the pan and bake until the rabbit is tender, about 45 minutes. The next time I do this, I might use a meat thermometer. 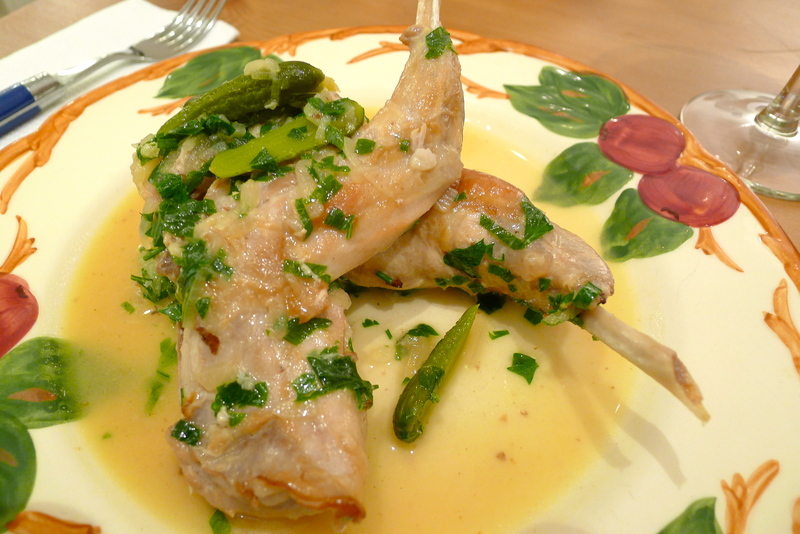 Rabbit should be done at 135° – 140°. The recipe says that if you can easily bend the leg at the joint, your bunny is done. 5. 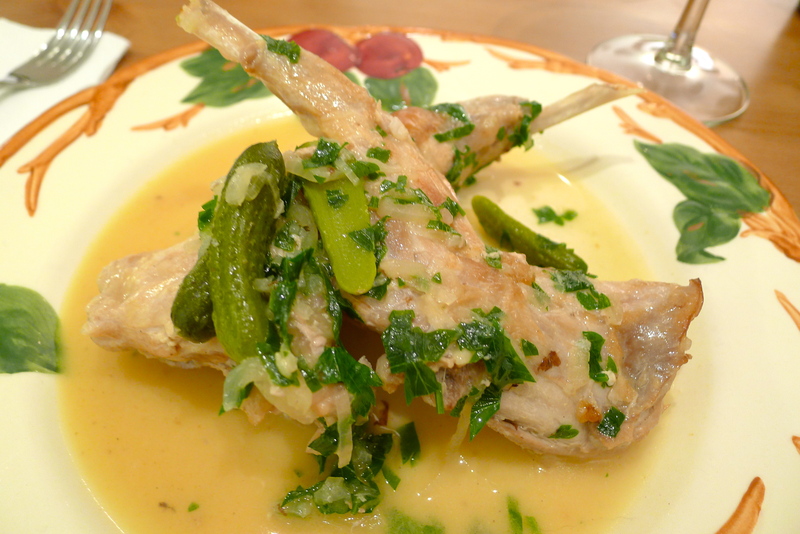 Remove the pan from the oven and transfer the rabbit pieces to a plate. Keep the pieces warm while you finish the sauce. Return the pan to the stove top and boil the liquid until the sauce has been reduced by about half. Whisk in the cubes of butter one at a time. The sauce should be nice and glossy. Add the rabbit back to the pan to just reheat it. Before serving, stir in the parsley.